Jim Hall was already acknowledged as a talented pilot when he proved an equally skilled engineer. The year was 1963, and the young Texan was just finishing his first complete season in Formula One. Having recorded some promising results at the wheel of a private Lotus, he was courted by several teams for 1964… but never returned – he already had other plans. 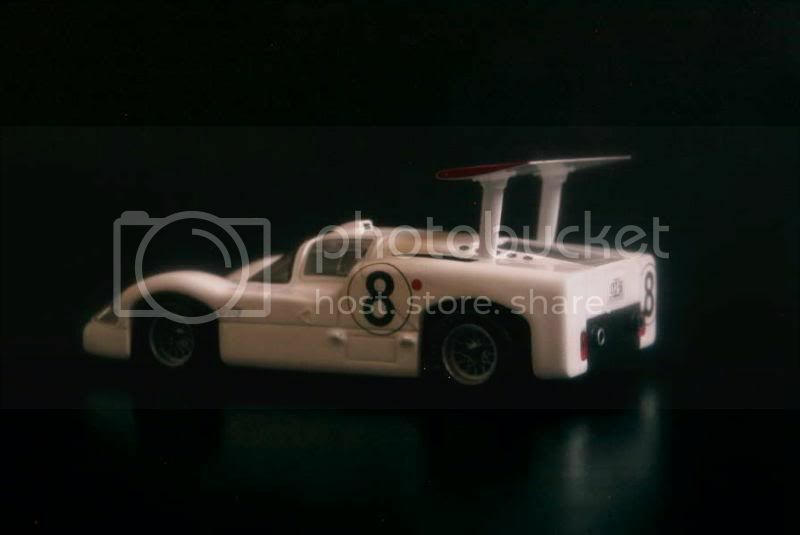 Actually, during the very same season, Hall had raced the first real machine he had designed on the American sportscar’s stage, the Chaparral 2. 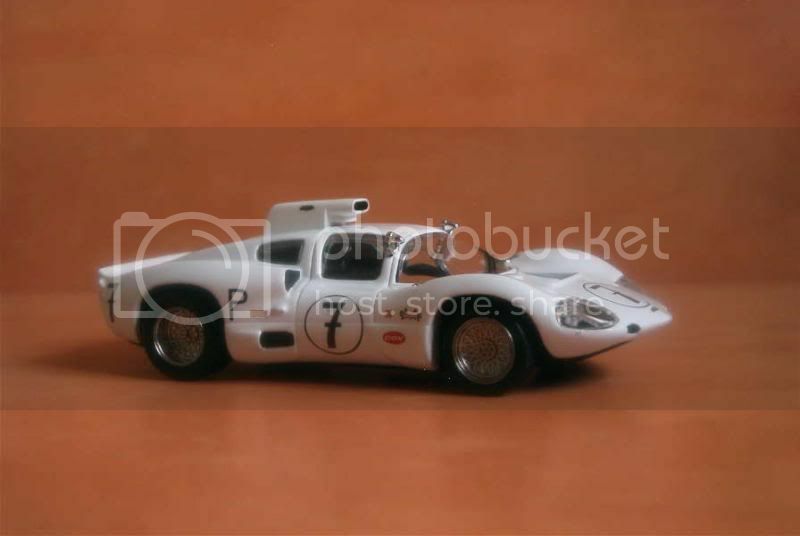 A very innovative car, this Chaparral, named after a Texan bird specie, was a spyder built around an inventive semi-monocoque structure carrying a fibreglass body drawn with aerodynamics in mind. Power was provided, as it was customary with most American racers of the time, by a small block V8, namely a Chevrolet. Fed by four two-barrel Weber carbs, it was good for about 420 bhp. This huge amount of power passed through a Colotti 4-speed gearbox before reaching the rear wheels. Soon Jim Hall’s approach proved successful. Constantly improved thanks to Chevrolet and Firestone’s supports, and even more to Hall’s methodical ways which pushed him to experience ever new ideas on his cars, the Chaparral 2 soon was the car to beat. The original 2 was followed by the closely-related 2B and 2C, the latter riding on an aluminium chassis. Chaparral also replaced the gearbox his car originally used by a self-developed automatic transmission, a rather uncommon characteristic that would become its trademark for years to come. After three seasons, the Chaparrals had won 22 of the 39 races they had entered, which gave Hall even more ambition. 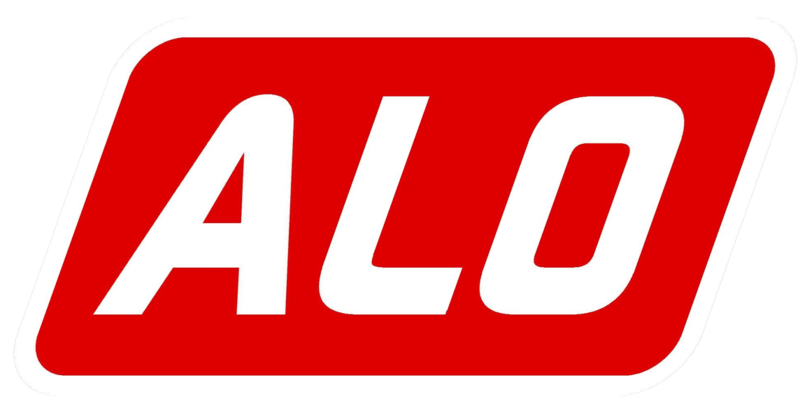 A logical step for a highly successful entrant in a national competition is to advance to the international level, that is, in Hall’s case, the World Championship for Makes. At the same time, a brand new championship for V8-powered spyders was being organized in North America, the CanAm. Which one would Hall next set his goal on? The Texan didn’t even choose – he decided to enter both in 1966. In endurance racing, Chaparral’s car would be the 2D, a small coupe capitalizing on Hall’s experiences in the field of aerodynamics. After showing unfulfilled promises during the two first races of the championship, a large air intake was added to the 2D’s roof and the car was sent to Europe. 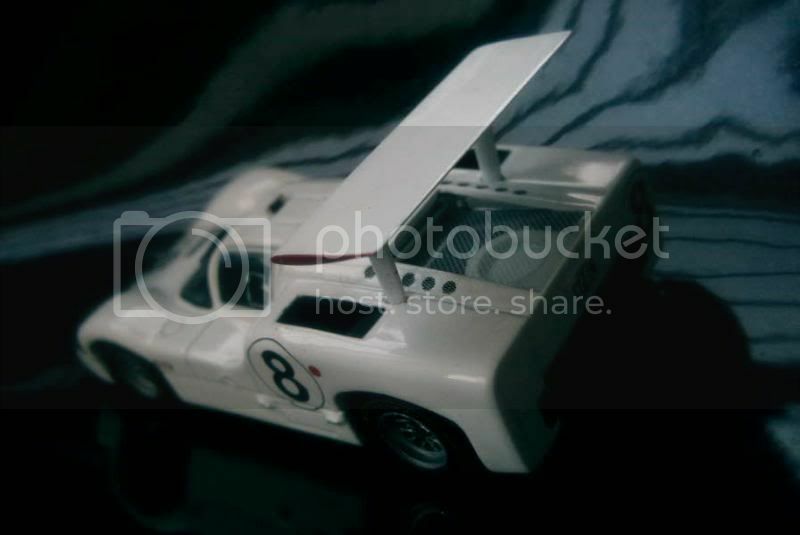 Facing large and potent opponents of the likes of Ferrari and Ford, the Chaparral won the 1000 km held on the twisty Nürburgring circuit. Unfortunately, the 2D was rather unreliable and this extraordinary success remained an exception. In CanAm, the 2E spyder pioneered the use of a high-mounted wing which added downforce directly to the rear axle. Actually Hall wasn’t the first one to imagine the benefits such an aileron could generate – as early as 1956, Michael May (another pilot-engineer, this time from Switzerland) had provoked much laughter by fitting such a peculiar contraption to his Porsche 550 spyder for a race at the Nürburgring. No one laughed anymore when May threatened even the fastest competitors during practice. As a result the other teams asked the organizers to ban May, which they did… at the same time postponing a crucial development for motor racing by a dozen years. The experience of both the 2D and the 2E were incorporated into the design of the 2F, Chaparral’s endurance racer for 1967. Another coupe, the 2F was equipped with a huge movable wing – having his left foot available thanks to the use of an automatic transmission, the pilot would depress a pedal in long straights in order to set the wing flat and generate minimum drag then, approaching a curve, he would release it – the wing would then flip into an angle, increasing both drag, which assisted braking, and downforce, which helped cornering. 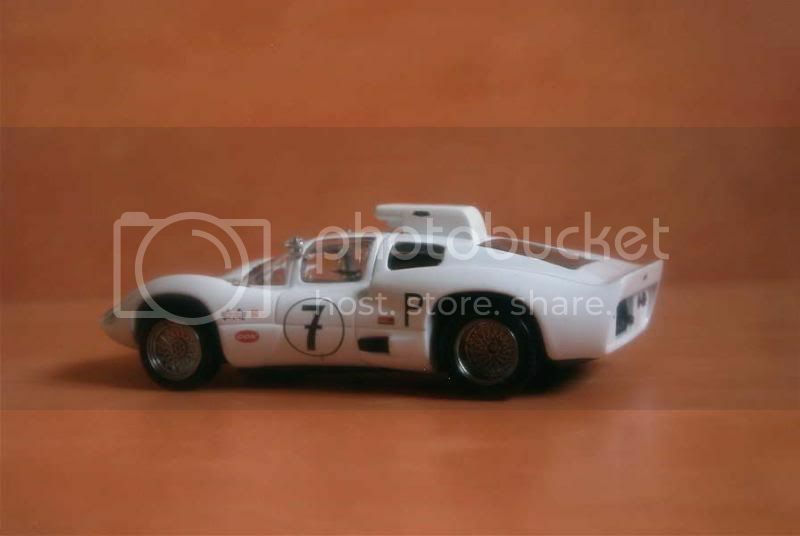 Unfortunately, the 7.0-litre, 525 bhp Chaparral 2F was as fragile as its predecessor the 2D, and would have demonstrated nothing if not for an unexpected victory at the BOAC 500 at Brands Hatch, the very last race of the season. Chaparral two-pronged effort saw the team entering a 2G spyder in CanAm, but the McLaren racers were rapidly gaining momentum and were increasingly impossible to beat. The FIA having banned prototypes of more than 3.0-litre displacement for the 1968 endurance season, Chaparral could concentrate on the CanAm, but the 2G, then the 2H (the “Great White Whale”) which replaced it in 1969, proved disappointing. In 1970, Chaparral took the CanAm world by storm with the 2J, which seemed finally able to shake McLaren’s utter supremacy. The 2J was powered by 7.4-litre Chevrolet V8 delivering about 680 bhp, but the reason of its success wasn’t there. A second engine, a tiny Rockwell twin placed at the rear of the car drove two large fans which literally sucked the car onto the road – in theory, so much suction force was generated that, turned upside down, the car could have stuck to the ceiling of a room… Practice times recorded by the 2J were astounding and, though the car was rarely able to finish a race, there was much moaning in the paddock against Chaparral. Near the end of the season, McLaren and other CanAm entrants were able to convince the organizers that the side skirts used by the 2J were illegal, and the car was banned. Seeing its progressive approach forbidden, Chaparral retired from racing. 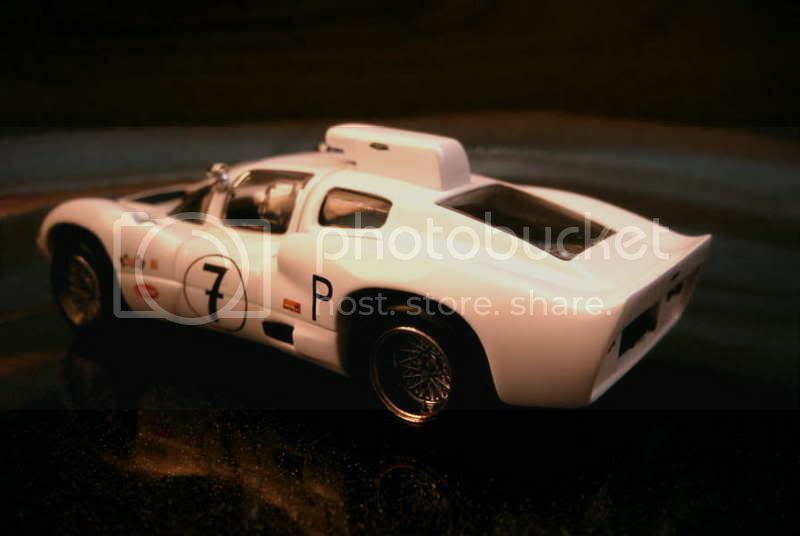 This Chaparral’s main weakness is its ugly wheels, Del Prado’s traditional Achilles’ heel. As the rest of the car is nothing more than average, I cannot give more than 9/20 to this model. Same car, a few weeks later in the Sarthe. I didn’t have on hand the necessary tools to unscrew the car from its stand when I took this photo, so I’m afraid you’ll have to wait for more pictures! Likewise, I’ll wait until I have a better look at the model to give it a rating. 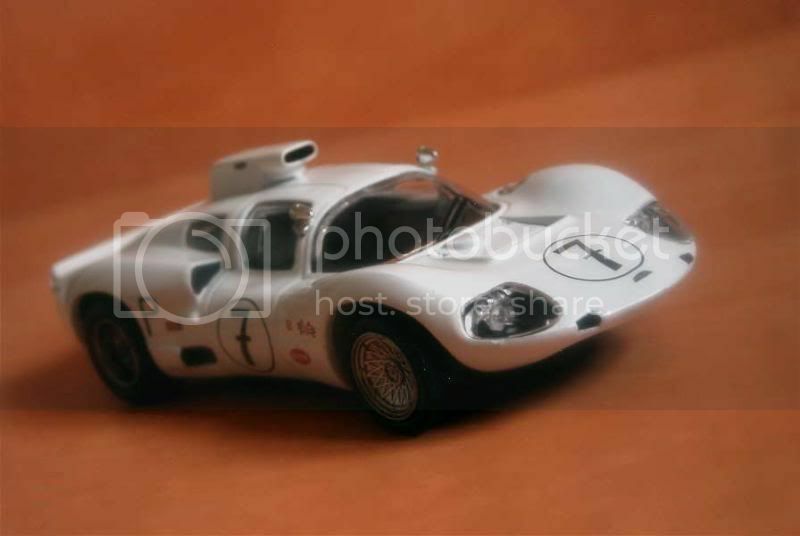 Altaya chose to include this historical model in its Le Mans series, despite the fact that it isn’t a winner. The Spanish company shall be praised for this decision, though Ixo’s rendition of the 2F isn’t among its best works. My rating is 11/20. Thanks RM Style. 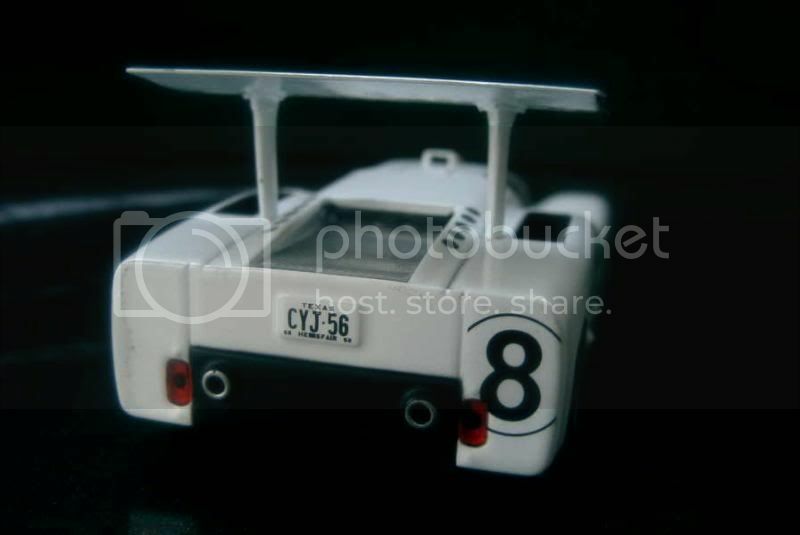 Note that the first Chaparral isn't an Altaya, though it's true that they have also released some time ago an Ixo-made 2D. Hey! It's been a long time since your last post. How are you? 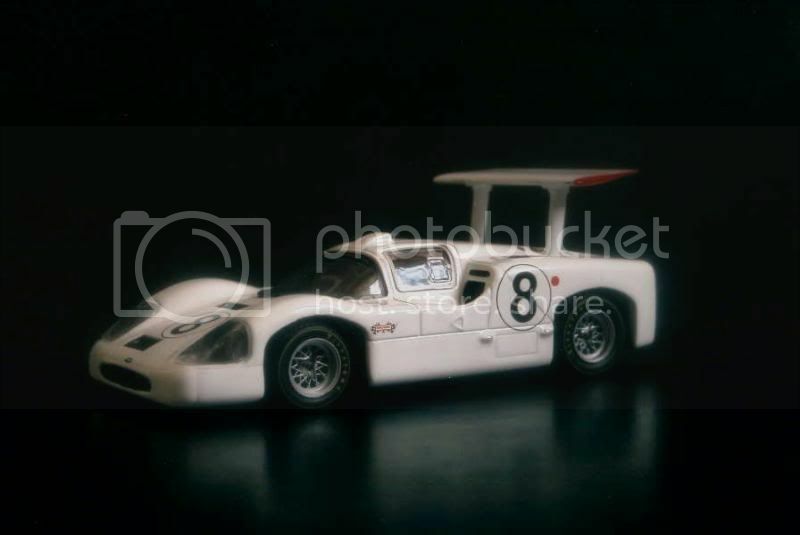 Jim Hall con sus Chaparral en los años sesenta les peleaba de igual a igual a los europeos en las pistas del mundo. Por suerte tengo exactamente estos dos modelos, ambos de Ixo. 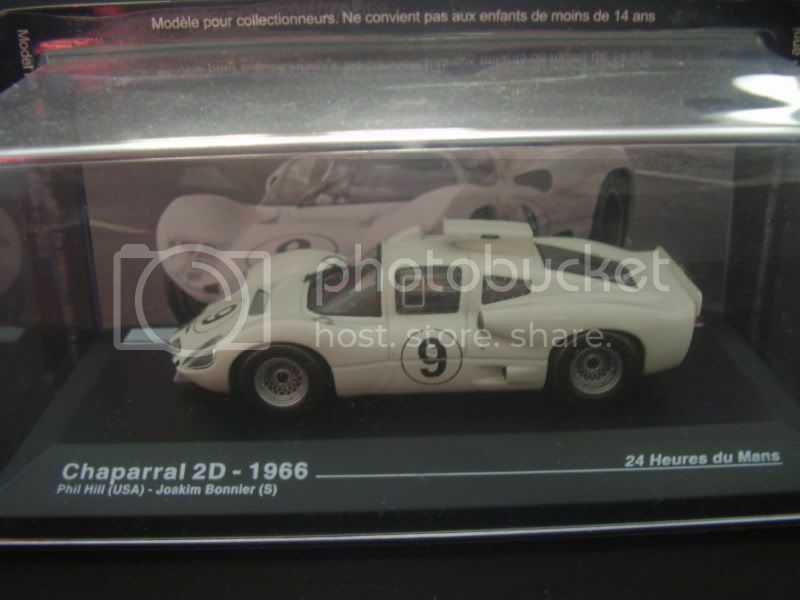 Yes Juanh, it's good that Ixo/Altaya didn't exclusively focus on sportscar winners and added to their range these two Chaparrals, very important cars from an historical point of view.